Novels by Zakhar Prilepin, Yevgeny Vodolazkin and Alexander Terekhov all aroused interest at the book fair, which is one of the largest events of its kind in the world. 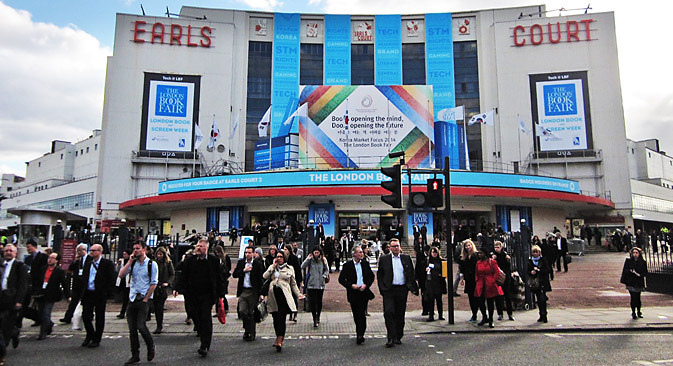 One of the largest book fairs in the world, the annual international book fair in London, was held from April 4 to 10. The London Book Fair is a very commercial event - this is the place to be for publishers and literary agents. But there are also forums for those who just want to talk about culture, society, and politics. For example, there’s the cozy PEN Literary Salon where a writer from some country is always giving a presentation and where it’s impossible to find an empty chair. Russia’s participation in international book fairs is traditionally associated with a wide-ranging cultural program. This year Russians were not just at the book fair itself, which as usual was held at the Earls Court Exhibition Center in London, but at other venues as well, such as Pushkin House (the Russian cultural center in London), the London branch of Rossotrudnichestvo, Waterstones bookstore (containing the largest selection of Russian books outside of Russia), and the Russian Embassy. Almost all Russian authors came to the fair not only with an intelligent speech prepared, but with books that have already been published in English. The very day after he arrived, Zakhar Prilepin held a reading of the English translation of his book Sankya, the novel that first brought him fame. It’s interesting that the book doesn’t observe the tradition of European political tolerance, and the novel was even controversial in Russia, since it describes the life of a young National Bolshevik with obvious sympathy. But the book won over its readers not so much because of its plot, but because of its human resonance, and its message of truth and justice - which have always rung true with young people. The interest of British publishers in Yevgeny Vodolazkin’s Lavr (Laurus) was even more unexpected. The novel is about a Russian holy fool at the turn of the 16th century. Where was Russia then and where was England? Where is England today and who cares about Russian medieval holy fools, who even in Russia are discussed only by historians and the religious? Nevertheless, Lavr piqued the interest of 11 British publishers, some of which are rather influential. They are to bid on the right to publish Lavr in Britain. Whether this indicates a new wave of interest in Russia remains to be seen. Vodolazkin explains it humbly as proof that people in Britain just haven’t heard of Russia’s holy fools. The interest in Britain for Alexander Terekhov’s Kamenny Most (Stone Bridge), which has already been released in English, was more predictable. The plot involves Soviet history, and the secrets of the Kremlin have always interested foreign readers. But it is significant that Terekhov’s novel is an example of impeccable, artistic Russian writing. At meetings with readers, there weren’t many questions about Crimea or Ukraine, strangely enough, although we had prepared ourselves for it. It seems we overestimate how much ordinary people in other countries are interested in politics. Whether that’s good or bad, that’s how it is. Some of questions were the kinds that Russians never ask anymore since they aren’t in fashion – the meaning of literature and the mission of the writer, the hero of our times, the connection between literature and journalism, the end of history, etc. The presentation by well-known translator and political scientist Dmitry Petrov was especially popular. Creator of a unique method for studying foreign languages, in Russia he teaches people English and in England he teaches Russian. In both countries he has quite a following. The author is a writer and a member of the Russian delegation to the London Book Fair. Did you visit a Russian event at LBF? Share your images with hashtag #LBFRussia!